Twice in my career I have worked as a web editor. Both times I felt constant pressure from within the organization to simply publish content online—content that was nowhere near good enough to see the light of day. More recently, as a consultant, I have seen many web editors struggle with the exact same problem. They get run down with requests and demands from the organization to produce and publish content and, as a result, the quality suffers. But web editors and copywriters can overcome this push and still create content that resonates with their users. In 1970, 25 years before most people had access to the Internet, American writer and futurist Alvin Toffler popularized the term “information overload.” Recently, the total number of websites exceeded one billion—a true example of the concept Toffler made fashionable. Let’s look at some more statistics. 80 million photos are uploaded to Instagram every day. 40 million posts are created each month on WordPress.com. 500.000 hours of video are uploaded to YouTube every day. 145 billion emails are sent every day. Basically, we’re flooded with content. James Gleick, historian and author of The Information, says, “When information is cheap, attention becomes expensive.” What he means is, as we’re flooded with information and exposed to tons of content daily, we’re becoming more careful and selective as to whom and what we’re paying attention to. Creating great web content isn’t about sitting down with a blank page in Word or Google Docs. It’s not about writing like Shakespeare or Hemingway. Creating great content isn’t even primarily about choosing the right words. The British government website gov.uk, for example, has excellent content. One of their goals is to get fewer phone calls and emails by allowing people to find answers using the website. Their content meets the criteria for “great” content because of the ways in which it meets these goals. In addition, the page leads to more relevant pages, so that users can continue their user journey via application forms, requirements, documents, and related pages such as “Check if you need a UK visa.” By answering these questions, the content supports the specific user needs. At the same time, the page will save the British government money because potential students can easily find what they’re looking for online, instead of calling the Home Office or showing up in person. They can check if they can apply, and send an application online. These methods are not meant as a substitute to content strategy, but rather as a supplement. Now, let’s look at each of them in more detail. 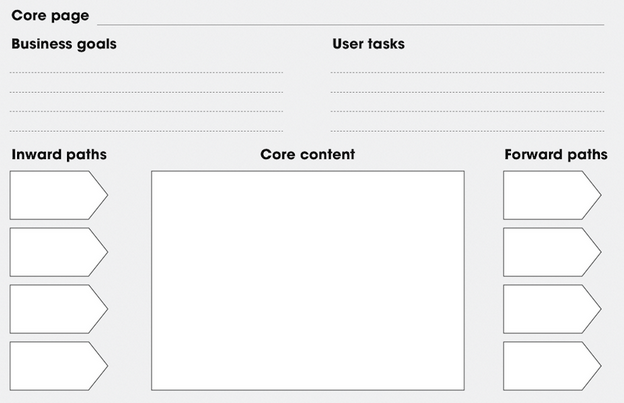 The core model, created by fellow colleague Are Halland, is a tool that maps out business goals, user tasks, and context. The core model is helpful in the concept phase of design projects as a way to get input from various members of the project group. Apart from copywriters, content owners, and editors, members of a project group might include product specialists, marketers, communications advisors, and developers. Members of the project can use the core model in pairs or in groups to write down and discuss business goals, user tasks, inward paths (i.e. how do customers arrive on this particular page? ), and forward paths (i.e. what are the customers supposed to do next?). It can also be used for sketching or visualizing core content. The core model from Netlife Research. The core model is useful when revising old content, creating new content, or building a website structure. It takes the focus away from the blank page and puts it into a more structured, business-oriented, and customer-centric setting. The content framework is a form that copywriters and editors can ask stakeholders, subject matter experts, higher-ups or content owners to fill out before they request new content. This framework provides a space for factual messaging, plus information such as business goals and intended audiences which ensures that writers and editors have the knowledge to write content that supports business goals and is helpful to users. 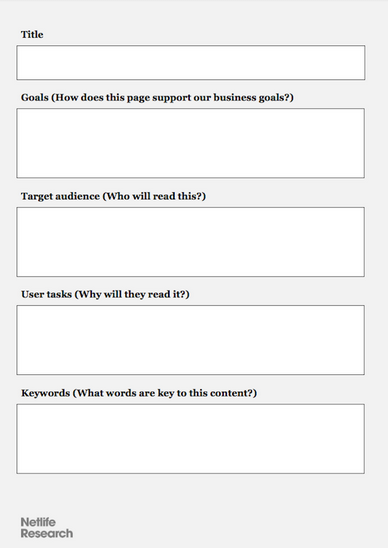 How does the content support business goals and strategy? Who will be reading it after it’s been published? What are those readers supposed to do? What keywords need to be included in the copy? The content framework from Netlife Research. Not only does this framework allow writers and editors to get on the same page with the business, but often, it actually helps employees, executives, and other stakeholders think through what it is that they want to say and who they want to say it to before it ever becomes a request for the writers. The content framework can be used on a day-to-day basis as a routine content development procedure. Pair writing is a technique that is derived from pair programming, where two people work together to write programs. In pair programming, the main programmer (the driver) writes the code while the other (the observer) reviews each line of code in real-time. The idea is to collaborate. So is it effective? Absolutely. Studies, such as “Evaluating performances of pair designing in industry,” have shown that collaborating as a pair has a positive effect on both quality and delivery time. In many of our projects, we apply this technique in the process of creating content. First we choose what pages we need to work on. Then we arrange a workshop with key people and project members. In the workshop, the participants pair up and work on the pages we’ve chosen beforehand. The main writer writes content, while the other asks critical questions. After a while, the participants switch partners—to get as much input as possible. 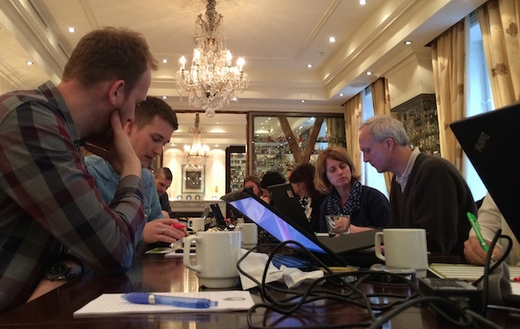 Netlife Research pair writing workshop. When people sit together and work on creating content together, magic happens. Suddenly, the focus is not on producing as much copy as possible, but instead, on having fruitful discussions about the meaning, quality, and relevance of content. Thus, it is a setting in which truly great writing flourishes. The more often this technique is used, the better. Gathering people to do pair writing once a month is a great start. All of these methods are extremely valuable in making people think before they write. They will help web editors and copywriters cope with internal pressure to produce quantities of content and publish it in a hurry. Over time, the methods can help establish completely new routines for creating and curating quality content. “Designing Inside Out for Better Results” by Ida Aalen is an excellent article that explains what the core model is and how to use it. “Write better content by working in pairs”, which I wrote, explains what pair writing is and provides a practical step-by-step guide to how it works. “Pair writing: A revolution in content creation” by Gerry McGovern reflects on content creation as a collaborative and network-oriented process.